creating a loving bond, easing colic pain, and ensuring a good night's sleep for baby and mommy! 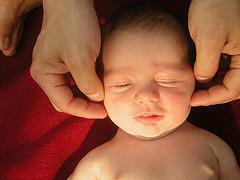 Baby Massage (or infant massage) includes slow, gentle strokes with very little pressure. It helps to create a calm, relaxing state for the baby and can often put him/her to sleep. Benefits of massage for babies! Some hospitals teach parents how to give a massage to their baby as part of the parenting classes they offer. However, parents also seek qualified therapists who have this training when their baby has colic or digestive issues. The main benefits of massage therapy for babies is that it provides a loving, bonding experience for you and your baby. And bonding time is one thing new parents can never get too much! But, because baby massage tends to deeply relax the infant, he/she can go to sleep faster, and stay asleep for longer periods of time. According to studies performed in 2008 at the The Touch Institute, in Miami, FL, infants who were given a bath with lavender-scented bath oil were more relaxed, as opposed to babies who had no lavender in their bath water. Read more about aromatherapy essential oil benefits...how different essential oils may help your baby with ailments or illness. The institute also did a study in 1987 of the effects of massage of preterm newborns to improve growth and development. It concluded that infant massage stimulation enhanced weight gain and responsiveness in preterm newborns, and may affect later growth and development. If your baby has ever had pain and excessive crying spells due to colic, you understand the desperate need to help them eliminate the pain. In studies of massage for colic, researchers concluded that babies who were massaged correctly experienced fewer crying episodes and experienced deeper sleep by the end of the study. Read more about colic and gas issues for babies at MomLovesBest.com. This DVD, Infant Massage: Power of Touch teaches how to help ease the pain of colic, digestive pains, and a lot of other common issues in babies. With so many positive benefits of massage on babies, many therapists choose to study the techniques of this therapy. Certified instructors train parents and caregivers on how to give a massage to infants and young children. After becoming a certified instructor, therapists are better equipped to share knowledge with parents and other healthcare providers.